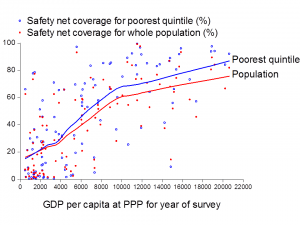 Poorer countries are less effective in reaching their poor. For example, the following graph gives the coverage of social safety nets across countries, from poorest to richest, based on household surveys that identified direct beneficiaries for each of over 100 countries spanning 1998-2012. (Safety net spending includes social insurance and social assistance, including workfare programs.) Richer countries tend to be markedly better at covering their poor, although the bulk of this is explained by differences in the overall coverage rate. Social safety net coverage rates for poorest quintile (poorest 20% ranked by household income per person) from the World Bank’s ASPIRE site. The data are available for 109 countries; the latest available year is used when more than one survey is available. GDP from World Development Indicators. This page provides some extra material and links on some of the largest direct interventions against poverty found in the developing world. The early emphasis of social policy making in the period following WW2 was for broad inclusion. Antipoverty policy was a tool for social solidarity, and targeting was not seen as important—indeed, it would have threatened the very aims of social policy in this period. That changed in many countries by the last two decades of the 20th century. Efforts to improve the cost-effectiveness of direct interventions in both the rich world and developing countries have often called for better targeting. This has been a recurrent debate. The reforms England’s Poor Laws in the 1830s called for better targeting, motivated in large part by the fiscal burden on the landholding class (EOP, Chapter 1). Similarly, calls for better targeting in the West came in the wake of the 1979 oil crisis, and in many developing countries facing debt crises in the 1980s. The political support for greater targeting comes from two distinct groups, with very different motives. On one hand, some want existing public resources to have greater impact on poverty; their aim was to help poor people. The other side is keen to cut the total cost of public support for poverty, to reduce its fiscal burden, including the tax burden on the rich; their aim is in large part to help non-poor people. The coalition of these different interests has pushed for greater effort at targeting antipoverty programs. The recent emphasis on targeting in many countries (both rich and poor) has typically defined targeting as avoiding “leakage” of benefits to the non-poor, implicitly downplaying concerns about coverage of the poor. Readily measurable proxies for poverty are widely used for such targeting in settings in which income means-testing of benefits is not an option. Efficiency considerations point to the need for using indicators that are not easily manipulated by actual or potential beneficiaries, although this is rarely very clear in practice. Geographic proxies have been common, as has gender of the recipient, family size and housing conditions. These targeting methods can be thought of as a proxy means test (as discussed in Chapter 5 of EOP) in which transfers are allocated on the basis of a score for each household that can be interpreted as predicted real income or consumption, based on readily observed indicators. Depending on how it is designed, this type of scheme can have better incentive effects than perfect means testing, and can have a higher impact on poverty for a given outlay than a poll transfer. The main alternative targeting method uses communities themselves to decide who is in need. Such community-based targeting exploits local information that is not normally available for the PMT but it does so at the risk of capture by local elites. Targeting performance in practice is often determined in large part by the local political economy. Leakage of benefits to the non-poor may sometimes be essential for the political sustainability of an antipoverty program. In programs with relatively large start-up costs, early capture by the non-poor may well be the only politically feasible option (especially when the start-up costs must be financed domestically). This can be dubbed “early capture” by the non-poor. In the (relatively few) studies that looked for early capture it was found to be present (EOP, Chapter 10). When budget cuts are called for, economists often advise governments to target their spending better. Yet this may run up against political-economy constraints in practice that limit the welfare losses to the non-poor from spending cuts. It may be especially difficult to protect the poor from public spending cuts in countries in which the poor are already the main beneficiaries of that spending. The outcome is unclear on a priori grounds, and will depend on the specifics of the setting. A study of a major social program in Argentina, Trabajar Program, illustrated how cuts can come with worse targeting performance; in the case of Trabajar, the allocation to the poor fell faster than that to the non-poor when aggregate spending on the program was cut (EOP, Chapter 10). An issue that has received less attention is the specification of the target group. When transfers are unproductive, the ethical case is strong for targeting the poorest. However, when there are productivity effects, such as arising from the existence of credit-market failures (EOP Chapter 8), the poorest are not necessarily the people with higher returns to transfers. For example, one study for Mexico found that transfers to poor farmers increased their agricultural investments, with longer-term income gains. However, the gains were found to be lower amongst those farmers with the smallest holdings, who are presumably the poorest. If the policy had focused solely on those farmers it would have had less impact on poverty. This is only one study, and further research is needed on both the productivity effects of transfers and the implications for targeting. Critics of antipoverty programs have long pointed to any signs of benefits going to ineligible people. There might be non-poor citizens pretending to be poor or corrupt local officials taking their cut. Tightening up administrative processes can sometimes help. So too can the use of new technologies, such as smart cards with biometric information. Some leakage is hard to avoid, however, and the costs of reducing it to zero may well be prohibitive. As noted above, some leakage may even help in assuring a broader base of political support for the program. Furthermore, efforts to eliminate leakage can run against the overall aims of the program. As in all aspects of program design, one must consider both the costs and benefits of reducing leakage in the specific context. A strand of the literature has focused on how local institutions have influenced targeting performance and impacts on poverty. A study of the Food-for-Education program in Bangladesh found that a number of village-level characteristics were significant predictors of the extent to which the program was effective in reaching poor people within the village. Weaker program outcomes for poor people were evident in more unequal villages. In neighboring West Bengal, however, one study did not find that similar factors had much influence on the pro-poor targeting of publicly-supplied credit and farm inputs, although such factors did influence employment generation for poor people. In a study for Brazil, it was found that local political institutions matter to the performance of a conditional cash transfer program, with much larger impacts in reducing school drop-out rates in municipalities where the mayor faces re-election. These findings point to the need for caution in forming generalizations across diverse settings. They also suggest that the problem of poor-area targeting may be more complex than simply reaching poor places, and also involves aspects of local institutions if one is to maximize the aggregate impact on poverty. These contingent factors can be subtle, however, and feasibility in practice is another matter. Further discussion and references to the literature can be found in EOP Chapter 10. In only comparative study to date of these measures of targeting performance, it was found that none of them reveal much about the success of a large cash transfer program in China (the Di Bao program) in achieving its objective of eliminating extreme urban poverty. (The paper can be found here.) The cities of China that are better at targeting this program, as assessed by these measures, are generally not the ones where the scheme came closest to attaining its objective. More encouragingly, the study found that the targeting differential does have a statistically significant positive correlation with the program’s poverty impacts. But even the TD is far from being a perfect indicator of poverty impacts. None of these targeting measures appear to be reliable indicators of a program’s cost-effectiveness, i.e., poverty impact at given program spending. The one exception is that the share going to the poor is a statistically significant predictor of cost effectiveness in reducing the poverty gap index. But, even then, about 60% of the variance in the cost-effectiveness ratio is left unexplained. All the other measures perform poorly, or even perversely, as indicators of cost-effectiveness. These findings echo some of the warnings in the literature against relying on standard measures of targeting performance for informing policy choices concerning antipoverty programs. The findings of the aforementioned comparative study of different measures of targeting also cast doubt on the generalizations found in the literature about what type of program “works best,” and so should be scaled up, based on cross-program comparisons of targeting measures. The external validity of these programmatic comparisons is highly questionable when the targeting measures have such a poor fit with poverty impacts. It is also unlikely that past findings on the socio-economic factors influencing targeting performance at country level are robust to seemingly arbitrary differences in the measures used. One question is left begging: Why have the literature’s warnings carried so little weight in practice? Possibly the more “theoretical” objections to these targeting measures have fallen on deaf ears for lack of clear evidence on how the measures perform in practice. The results of case studies such as that described above will then help. One can also conjecture that the preference for targeting measures that put a high weight on avoiding leakage to the non-poor stems from fiscal pressures, given that reducing leakage helps cut public spending, while expanding coverage does the opposite. While one does not doubt that such thinking has had influence at times, it is surely misguided. For if the problem was to minimize public spending (unconditionally) then why would governments bother with such programs in the first place? Evidently there is a demand for these policies, as part of a comprehensive antipoverty strategy. A more credible characterization of the policy problem would then give positive weight to both avoiding leakage and expanding coverage of the poor. From that perspective, measures of targeting performance that penalize both errors of targeting make more sense—again echoing recommendations found in the literature (EOP Chapter 5). However, that conclusion would still miss the point. Analysts and policy makers might be better advised to focus on the estimable outcome measures most directly relevant to their policy problem. Impacts on poverty can be assessed with the same data and under the same assumptions as required by prevailing measures of targeting performance. These and other measurement issues are discussed further in Chapter 5 of EOP. An evaluation of India’s National Rural Employment Guarantee Act (NREGA): Right to Work? Workers in Bihar digging an irrigation trench under the NREGA. This type of information intervention—“edutainment” as Eliana La Ferrara dubs it in her paper “Mass Media and Social Change”—can also be revealing about the the processes of knowledge diffusion, as demonstrated in “Social Frictions to Knowledge Sharing” by Alik-Lagrange and Ravallion. They find that the knowledge diffusion process is far weaker for disadvantaged groups, defined in terms of caste, landholding, literacy, or consumption poverty. 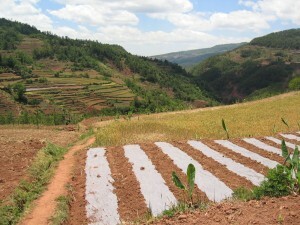 Plastic mulch being used to conserve water and suppress weeds for enhancing crop yields in poor areas of SW China as part of the SWPRP. Proxy-means testing has emerged as a popular method of poverty targeting with imperfect information. In a now widely-used version, a regression for log consumption calibrates a proxy-means test score based on chosen covariates, which is then implemented for targeting out-of-sample. A new paper, poor-means-test, studies the performance of various proxy-means testing methods using data for nine African countries. Standard proxy-means testing helps filter out the nonpoor, but excludes many poor people, thus diminishing the impact on poverty. Some methodological changes perform better, with a poverty-quantile method dominating in most cases. Even so, either a basic-income scheme or transfers using a simple demographic scorecard are found to do as well, or almost as well, in reducing poverty. However, even with a budget sufficient to eliminate poverty with full information, none of these targeting methods brings the poverty rate below about three-quarters of its initial value. The prevailing methods are particularly deficient in reaching the poorest. We should strive for something better. Effective antipoverty policies must consider all the relevant constraints in real-world settings. Incentive constraints–such as the scope for non-poor people to pretend they are poor so as to benefit from the policy–are clearly important, though they have sometimes been exaggerated; see the discussions in Chapters 1 and 10 of EOP. The discussion above also points to the importance of informational constraints, even when incentive effects are small. Some of the same factors that create and perpetuate poverty, including weak administrative capabilities, also make it harder to reach poor people. And here we must also recognize that reaching poor households (even when we can) does not assure that we are reaching poor people. And poverty is an individual attribute. In this paper, “Are Poor Individuals Found in Poor Households?” with Cait Brown and Dominique van de Walle, we document how widely the incidence of undernutrition in women and children in Africa is spread across the distribution of household wealth. This short article, “Reaching Poor People,” in Finance and Development provides a non-technical summary of the two papers described above. Straw man 1: A BIG is too expensive. Critics of the BIG idea argue that it would cost far too much to be seriously considered. Yes, some BIG proposals have had scary price tags. But that misses the point. Most countries (including many poor countries) are already spending public money on poverty reduction. If the same resources are better spent fighting poverty using a BIG then that should be done. We can ask that question at any given level of the basic income. Straw man 2: We don’t need a BIG because we can eliminate poverty at a much lower cost. The favorite calculation here is deceptively simple: just measure each poor person’s poverty gap—the distances below the poverty line for all the poor—and make handouts accordingly. Voila, no more poverty! A budget to cover the aggregate poverty gap will almost always be way less than the cost of a BIG. This calculation is deceptive for three main reasons. The first it ignores incentives; such a policy can create a poverty trap due to its (implicitly) high marginal tax rates on poor people. Second , it ignores the information constraints on targeting, which can be severe, especially in poor countries with weak administrative capacities. Third, when the budget is free to vary, finer targeting may well undermine the public support (notably from the middle class) for antipoverty policies; the poor end up with a larger share of a smaller pie, with ambiguous gains. Straw man 3: Targeting in practice may not be perfect but it is good enough. A simple method assigns transfers based on observed categories, such as location, household size and/or landholding (in rural areas). More sophisticated versions use a “proxy means test” (PMT) in which a statistical model is calibrated to a limited set of readily observed household characteristics in a sample survey, which is then used to predict who is poor in the population as a whole using those characteristics. However, these methods have often proved disappointing in practice. Even with a budget sufficient to eliminate poverty with perfect information, the bulk of the poverty will probably remain in practice. Experience and some research have also pointed to the horizontal inequities of targeted social policies in practice. To many eyes at community level these policies appear opaque and even pretty close to random. On the ground, people see plainly that equally poor families are being treated very differently by these targeting tools. Some get help but others do not. The obvious unfairness of this situation can generate social conflict and undermine well-intentioned social policies. Whether the information actually available to policy makers is both reliable and sufficient for the task of targeting is an open question. It should be looked at carefully in each setting, taking account of the potential social tensions that can be generated by getting it wrong. But it should not be presumed that there are large gains for poor people from exploiting the information actually available in practice. Straw man 4: A BIG destroys incentives to work. This one is surprising since a true BIG is probably about the most non-distortionary policy imaginable. Nobody can do anything to change how much they get. Granted there will probably be a positive income effect on demand for leisure. However (like all transfers), one must also consider impacts on other relevant constraints facing poor families, including uninsured risk and credit constraints. Incentive effects should not be ignored. High marginal tax rates on poor people can be generated by some targeted policies and that is a bad idea. But it is also evident that the incentive concerns are often exaggerated, and do not seem so serious in practice. Straw man 5: By focusing on cash a BIG diverts attention from health and education. The tradeoffs are undeniable. However, when thinking about a BIG we can define “income” quite broadly—not just cash income. A “full income” concept is appropriate, including imputed values for services in kind, such as publicly-provided health insurance and schooling. A BIG discussion can thus emphasize these “non-cash” dimensions of welfare. The composition of the basic (full) income package is then a matter of policy choice. That choice is important and it will never be easy. There are real concerns about paternalism (overriding the preferences of poor people). But the key point here is that non-cash benefits should be factored into any characterization of what exactly is being guaranteed. So that is not a valid case against a BIG. There are arguments both for and against each of the two main approaches to antipoverty interventions, either to strive to guarantee work or to guarantee income. The paper, “Guaranteed employment or guaranteed income?”, critically reviews the arguments. Decentralized implementation of the right-to-work poses serious challenges in poor places. Evidence on India’s National Rural Employment Guarantee Act (NREGA) does not suggest that the potential for either providing work when needed or reducing current poverty is realized, despite pro-poor targeting. Instead, work is often rationed by local leaders, and the poverty impact is small when all the costs are considered. The option of income support using cash transfers also has both pros and cons. Widely-used methods for finely targeting cash transfers tend to miss many poor people, and discourage those reached from earning extra income. Yet it cannot be presumed that switching to a universal basic income will reduce poverty more than workfare or finely-targeted transfers; that is an empirical question and the answer will undoubtedly vary across settings, belying the generalizations often heard from advocates. 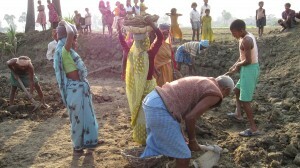 For example, in a study of NREGA in Bihar it was found that, once all the costs were considered, the same budget allocation would have had as much, or even more, impact on poverty if it had been disbursed as an (un-targeted) basic income (as explained in this paper: “Workfare in labor surplus economy.“). Nonetheless, more incentive-neutral, universal and/or state-contingent transfer schemes merit consideration in settings in which existing public spending is skewed against poor people and/or there is scope for raising taxes on the rich.